PIP flexion contractures result from a torque imbalance across the joint. Either there is not enough extensor force, too much flexor force, or a combination of the two. 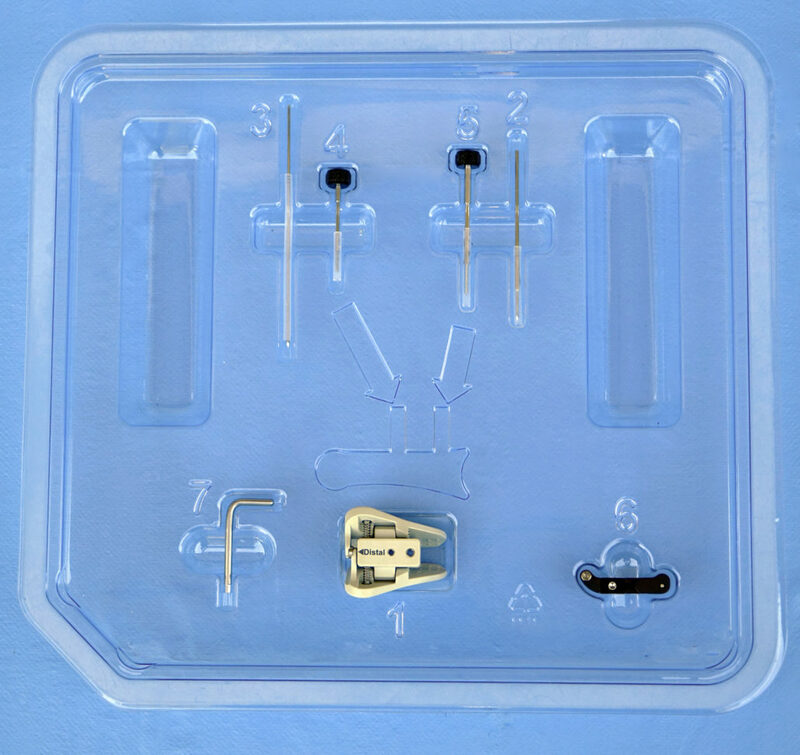 The Digit Widget reverses these contractures by utilizing the principle that gentle force applied over time will stimulate growth of contracted soft tissues. 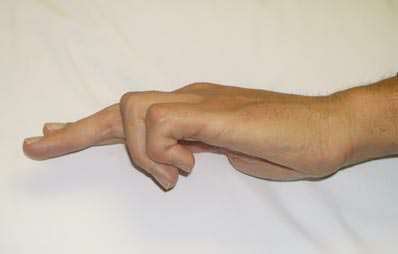 The Digit Widget applies extension torque to reverse the contracture, instead of joint traction used by other methods. 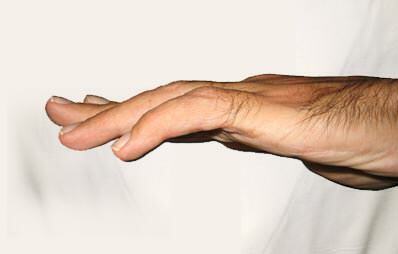 The Digit Widget does not prohibit finger flexion. The patient remains more active during treatment thereby minimizing joint stiffness. It is important to remember that while the Digit Widget is very effective in reversing PIP contractures, maintenance of active joint extension requires identification and treatment of the underlying cause of the each patient’s PIP joint contracture. Patient is diagnosed with recurrent Dupuytren’s Contracture. 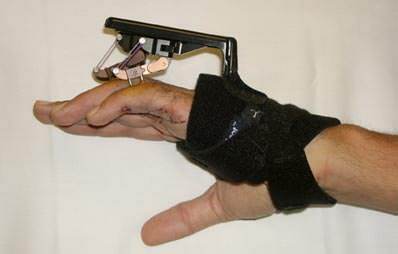 Two Digit Widgets were applied pre-fasciectomy to reverse the contracture: two small incisions were made to divide bands on the little finger with one incision adequate for the ring finger. The Digit Widget needs to be worn full time. 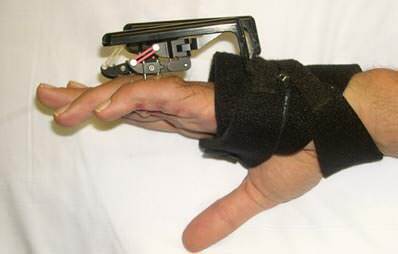 The dynamic portion of the device can be “clicked off” the finger for bathing and active flexion exercises. After six weeks of wearing the Digit Widgets, the patient’s extension had plateaued. He was scheduled for the fasciectomy. Restoration of extension, as a function of time, varies with the etiology of the contracture (i.e. torque imbalance) and the biomechanical properties of the contracted tissues. In Dupuytren’s, a gain of 10 to 20 degrees per week is typical. Following two months of extension torque, the patient gained almost full PIP extension. Surgical excision of the diseased tissue was followed by continued extension torque at three weeks post op. The device’s skeletal pins should not be removed until voluntary “active” PIP extension demonstrates maintenance of the improved “arc” of motion. 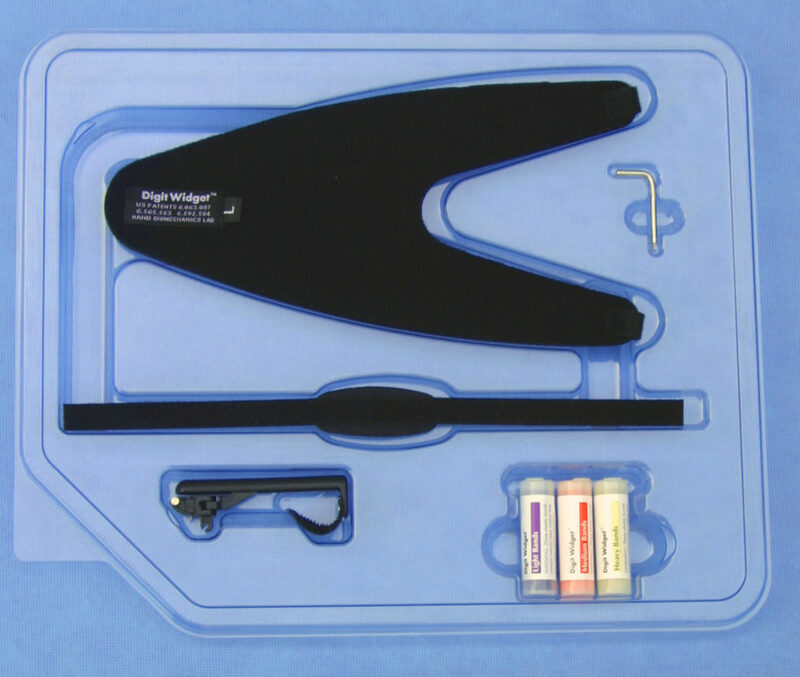 The patient’s “widgets” were removed following four months of extension torque. 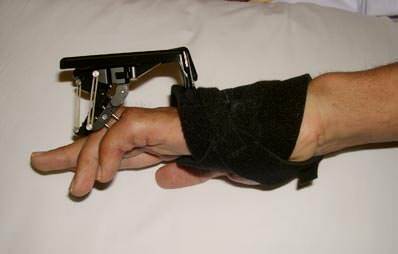 Night splinting for six to nine months following device removal helps maintain active finger extension.